This page lists changes prior to the most recent version. See What's New for changes to the most recent version. Decreases the time FileBoss takes to load and start on many systems. Solves problem where FileBoss would sometimes freeze or exhibit strange behavior after deleting multiple folders. Solves rare startup problem encountered on a few XP 64-bit systems. Removes the Only if newer overwrite option from the Move dialog as a safety precaution. Better registration support for Windows 7 x64. If you have FileBoss version 2.502 and you don't use Windows 2000 you do not need to download and install this release as the changes only affect users of Windows 2000. This release is a fix for some installations of Windows 2000 where FileBoss would not display any files or folders in the either the left or right windows (folders list or contents views) except the Recycle Bin and, possibly, a link to Windows Explorer). Version 2.510 is a free upgrade for all current FileBoss customers. Just download, install and enjoy! Version 2.5 is a free upgrade for all current FileBoss customers. Just download, install and enjoy! FileBoss version 2.5 will install right over your current production version of FileBoss. Although the new version has a completely different method and format for storing options, settings and virtual folders, the first time it is run it will read in the old files, convert them to the new format and then write out the new format to disk - leaving the original files intact. Immediately following the list of additions and changes below are detailed descriptions of everything that is new. To go directly to the details click Detailed Descriptions of Additions and Changes. Command bar will now select files that are entered, not just go to it. Tools and Viewers dialog data can now be loaded and saved independently. Fixed rare but significant bug in rename routines where when adding folder names the folder names could be added multiple times. Fixed CD/DVD file listing which occurred on some HP LightScribe drives. Show true icons with programs such as Tortoise CVS. Default compare resolution now five seconds. Copying to network drives time outs have been improved, i.e. they don't occur frequently. This is a great way to quickly synchronize a backup folder or path with another or to backup files and is ideal for when you want to make the backup folder the same as the source folder with the safety of not accidentally copying files the other way around. The complete details are located on the Quickly Backup and Sync page. You can enter as many paths as you want up to a limit of 32,000 characters. Enter the list of folders in the Destination(s) field as shown highlighted in yellow above. Each path must be separated with a comma, semi-colon or the bar character (, ; or |). Clicking the Browse button will display a folder picker where you can select one or more folders that FileBoss will enter into the Destination(s) field for you. And you can always click the Edit button to bring up a dialog where you can add, edit and order the paths. This is especially handy when dealing with more than three or four paths. For more information about copying to multiple folders in one command see Copy to Several Folders at Once. To enter multiple target folders easily use the Browse button to the right of the Destinations field. This will open a special dialog for entering or editing multiple destinations. FileBoss will now auto complete filenames in most dialogs and on the command bar when the full path is given and is the first thing to be typed in the field. To type or paste in a complete file or folder path to go to press F8 put the cursor in the Command Bar (and display the command bar if it is hidden) and then type or paste the path hitting the Enter key or clicking the green arrow to the right. This menu hides or displays groups of folders defined by special attributes or other conditions as explained below. Note that these are global settings and changes will affect all Explorer tabs both current and future. These settings are not present and do not affect Virtual Folders. The default setting is to Exclude None. Hide all files and folders that have the Hidden, System, or Hidden and System attributes set. 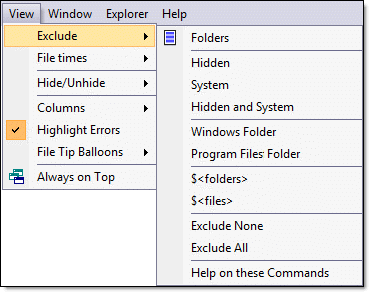 The Hidden and System setting requires both attributes to be set for the file or folder to be excluded. Hide all folders when the name starts with a dollar sign. Folders with a name starting with a dollar sign are frequently special folders used by the Windows operating system. Hide all files when the name starts with a dollar sign. Files with a name starting with a dollar sign are frequently special files used by the Windows operating system. Turns all of the above settings off or on. However the Folders setting is not affected. Excludes or includes folders in the contents (right-hand) window. This toggles their display on and off. Options for the display of folders can also be changed using the Explorer > Display Folders at > command from the main menu. These commands allow you to hide the folders or to display them at the top or bottom of the list. When My Computer folder (or just Computer depending on the version of Windows in use) is displayed you can now have it show the size, used and free space on all your drives and even sort by it. The graphic the right is a sample of the drives sorted by the amount of free space they contain. 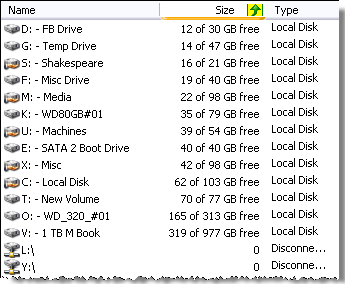 The screen shot to the right shows the drive sizes option set to show the free space and is sorted by the amount of free space available on each drive. For complete details see How to display drive information. are now displayed as what humans consider the proper order. FileBoss can be hidden during a long copy operation by either hiding FileBoss's main window leaving just the progress dialog visible or by minimizing everything to the system tray. 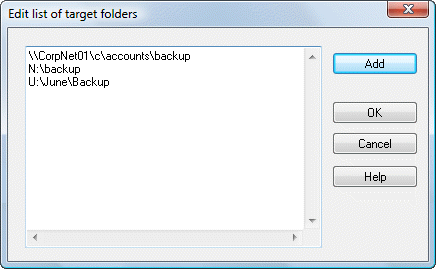 FileBoss can be hidden from the progress dialog, from any of the copy dialogs or by using meta-commands. For Complete details see Hiding FileBoss. The way FileBoss handles the folder listings when changing CDs and DVDs has been improved to lessen the number of mouse clicks to get the listing of the new media. Fixed problem with erroneous file listings on some HP LightScribe drives. Previously the name of the first file would be repeated for each file on the CD / DVD. When performing some operations on files, e.g. long copy operations, where there is the option to skip any errors, and that option has been selected, FileBoss will automatically display the error history window after the operation is complete if and only if there were errors. The Search toolbar button (on the upper-left toolbar in the default configuration) has been renamed to Find and now invokes the last Find operation when clicked. So if the last selection from the Find menu was Find > Recent Files... then when the main Find button is clicked it will invoke the Find Recent Files dialog. To make running FileBoss as administrator easier and shortcut specific the /elevated command line parameter can be used. This is most useful under Windows Vista and later versions of Windows. When specified Windows will prompt for permission to continue and then launch FileBoss in elevated mode. The /select command line parameter is only significant when another command line parameter gives gives the full path to a file. When that is the case FileBoss will open the appropriate folder and select the specified file. The automatic rotation of the drop mode when the Drop Mode toolbar button is pressed has been shortened to toggle between Copy and Move rather than Copy, Move and Create Shortcut. The Create Shortcut mode can still be easily selected by clicking the arrow to the right of the button or using the Options > Default Drop Mode > options from the main menu. When a bookmark is created a small dialog will be presented where you can either accept the default bookmark name and target or edit them as you wish. File extensions can now be removed not just renamed using the Change Extensions panel of the Rename dialog. Just select the Change to option but leave the field blank as shown below. The Backup if Newer... copy routine can now use comparison information other than the modified dates to determine when a source file is 'newer' and should overwrite a target file. The new criteria includes the created and accessed dates as well as whether the source file is larger or smaller than the target file. The number and format of the entries in all the History (log) windows have rationalized and reformatted for easier reading and better grouping. Files can now be touched recursively with the option to not stop on errors, e.g. file not found, with any errors logged to the Errors log window which will be displayed after the operation is finished. The resolution for determining if files have the same file time (Modified, Created, Accessed) has been expanded from 1 second to 5 seconds. This new time takes into account the different ways various versions of Windows store these times. All data and Virtual Folder files created by FileBoss are now interchangeable between the 32- and 64-bit versions of FileBoss. In addition all files are now in standard xml format providing great flexibility not only for the current version but more importantly for the new tools in future versions of FileBoss. 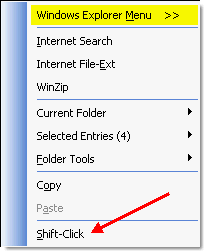 In order to speed up access to FileBoss features many of the right-click menus have been expanded to include what use to be sub-menus. FileBoss now shows the same icons as Windows Explorer displays for such program as Tortoise and other special file management systems. Fixed bug where the current folder could not always be renamed. Long copy operations are now easier to abort during the copy. Under some circumstances commands on right-click menus were not active when they should be. The animations (flying folder) in progress windows would freeze even though copying was progressing normally. Sometimes the current folder could not be renamed in the left window of an Explore tab. Version 2.3x is a free upgrade for all current FileBoss customers. Just download, install and enjoy! When copying folders and file patterns have been specified to include or exclude in the copy FileBoss will only copy the specified files and not copy or create folders that do not contain the specified files. This is shown in area highlighted in pink. Then the folders are copied normally i.e. all files and folders even empty folders. 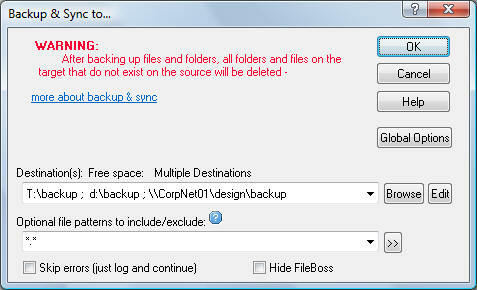 This feature is available in the Copy, Backup if Newer, Move and Time Controlled Copying routines. Corrected rare problem where it was possible to delete files that were not part of a move operation when file patterns were used. Expanded FileBoss's capability to handle drops from more special external programs such as FTP clients. FileBoss now handles files with multiple streams and other advanced characteristics in addition to standard file types. FileBoss now applies special routines to copy large files i.e. files greater than 16 MB, faster and more efficiently. Every Find dialog (accessed via the Find main menu) now allow the searches to be case sensitive. While this option is only infrequently needed when it is needed it can be invaluable. Cut and paste is now implemented within FileBoss. You can use Ctrl-X, Ctrl-V or the commands from the Edit menu. Pressing the Backspace key in a normal Explorer Tab when in the navigation window (the list drives and folders on the left side)now moves the current folder up one level in the folder hierarchy. This is compatible with the same action in Windows Explorer. File icons now show the shortcut overlay when appropriate. A Run as Admin command has been added to the command bar. When executed FileBoss will start another instance of itself but with Administrator permissions (on most systems you will be prompted to allow the program to run, for an Administrator name and password or for further information. This command is mainly useful for those running Windows Vista and later operating systems. Meta-variables can now be used as part of the path when coping files in the same manner meta-folders can be used. Previously meta-variables were only available when renaming files. In the above example T:\daily\<today>\accounts might translate into (depending on the current date, of course) T:\daily\2008-12-05\accounts. If the path does not exist FileBoss will ask you if it should be created. The Find dialogs (those used by the commands under the Find main menu) have been completely reworked to better remember previous settings and actions. The right-click menu was confusing to some due to the FileBoss menu having the the link to the shell menu at the top and the shell menu having the link to the FileBoss menu at the bottom. The are now both at the top. Fixed a bug that would not display the progress bar on some systems. During long operations it could appear that FileBoss had hung when actually it was working normally. A problem has been corrected that was caused by some other programs that implement global key logging and then act upon those key sequences themselves. This was noticeable when those program were installed and the common Edit > Copy and Edit > Paste command were issued. Previously FileBoss would act on the command and then the background programs would pass the command on to Windows for processing creating confusion. FileBoss now blocks this type of activity from interfering with itself. The Startup Panel of the main options routine (select Options > Program Options... from the main menu. Has been reorganized to make the relationships between the various options more apparent. Service Pack #3 for Windows XP implemented some new security policies that interfered with FileBoss accessing folders on network computers using the shortcuts to those folders listed under Network (or My Network depending on which version of Windows you are using). This has now been corrected by FileBoss working around the limitation. Corrected problem where searching for text could not be stopped quickly when searching huge files. The same problem would sometimes appear when using partial paths in the Patterns fields of the search dialogs. Fixed obscure relative time search. Previously when searching for files that have changed (or not changed) with the This Week setting and the current day was a Sunday no results would be returned. Fixed rare crash that would occur when right-clicking over a folder in the navigation (left-hand) window of a Virtual Folder or when attempting to rename the folder. This is a quick list of changes, big and small, made for FileBoss V2. Complete new GUI that not only makes FileBoss easier to use but allows greater flexibility, customization and a more convenient workspace. Not just tabs but tab groups too. Copies all files (or those that match optional file patterns) to one folder, either the root of the folder or another, user specified folder. All times in search and select routines can now be specified as relative times, e.g. 'since yesterday', 'more than two months ago' etc. Combines files together (normally only useful for text files) to a new file or appended to an existing file. A new check box has been added to every Copy based dialog that when checked will tell FileBoss not to stop and ask you any questions when it can not copy a file (for instance if it is locked by another program) but rather to just log the error and continue. Deletes specified (or all) files from a folder and all its sub-folders with the option to delete any empty folders afterward. Used to clean out temporary files. Also used to delete files in problem folders as the routine will not stop when it encounters an error but rather continue deleting all the files it can. The default engine for copying Drag & Drop operations (on FileBoss) is now FileBoss for copies and links and Windows for moving files. Drag & drop Move operations are now always handled by the windows copy engine no matter what the specified copy engine is (e.g. The setting in the Advanced Options section of the Program Options dialog. The opposite of Find Modified Files, i.e. finds files that have not been modified, accessed and/or modified within a specified time. Most commands on the Actions menu can now be applied to the selected folder in the folder navigation window as well as to selected entries in the contents window. FileBoss determines which selection to use by which was the last to be selected. Designed for large copy operations this special copy routine can insert timed delays between files, between copy blocks within a file and / or every number of bytes copied. Previously the browse dialogs always opened to the Desktop folder. Many actions, such as renaming, can now be recursive. This is especially useful when performing actions on the current folder in the navigations window. The Find routines, e.g. Find Old Files, Find Long Filenames, etc, will now automatically use the currently selected entries as their starting point (the Paths field) from the navigation or contents window as appropriate. Dynamic Virtual Folders are very much like traditional Virtual Folders except that you can add (just drag and drop), delete and manually sort entries. They can be created from selected entries, via a folder picker, empty or from a list of files contained in an external text file. All of these are created using the commands on the File > New Dynamic Virtual Folder > menu. Tabs can be split up into separate groups, vertically or horizontally so that more than one tab can be viewed at a time. FileBoss's powerful renaming control center has been simplified with fewer options per page on more pages. To start FileBoss and control what it loads and doesn't load from the last session hold down the Ctrl key until the start dialog appears in which you can choose the various load options. Added up and down buttons. : or 'find ' or just a simple file pattern will activate the up and down arrow keys. Bookmarks have been renamed Favorites. This has been done so the under thirty-five group will know what they are. File Sets have been renamed to Virtual Folders so users under thirty will know what they are. One advantage of this is that in the returned Virtual Folder you can just do a select all and go straight to the structured file copy routine as no extraneous file will be in the File Set. Version 1.6 does not exist. The need for compatibility with Microsoft's new Windows Vista overtook our release schedule and 1.7 is the result. Printable, viewable, chewable PDF Manuals are now available for download. To find out more and download your very own today go to PDF Manuals. 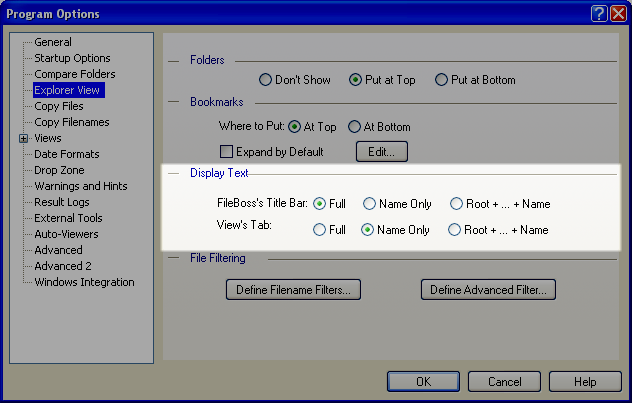 FileBoss is now compatible with the Vista version of Windows as well as Windows XP, 2003 and 2000. Previously when FileBoss was run on many Vista installations it would take several minutes for any menu to be displayed giving the appearance that FileBoss had crashed. Added support for filenames up to 2048 bytes long. Which operations are available for filenames over 259 bytes is dependent on the version of Windows, the file system and other programs in use. But renaming is almost always available (to shorten the filenames so they can be used by other programs). Use the Command Bar (F8) to equate one or more file's times. Such as making all the created file times the same as all the modified times. Both the setup file and the main executable file, fileboss.exe, are now digitally signed. The certificates are issued by VeriSign, the most trusted name digital security for Windows. Better detection of new devices such as USB flash and hard drives as well as when new volumes are mounted, e.g. encrypted logical drives. When copying files and the target already exists the dialog asking you what to do now contains a field for you to enter a completely new filename for the copied file. The maximum length of strings to search for in files has been increased from 255 characters to over 32,000 characters to accommodate complex RegEx searches. 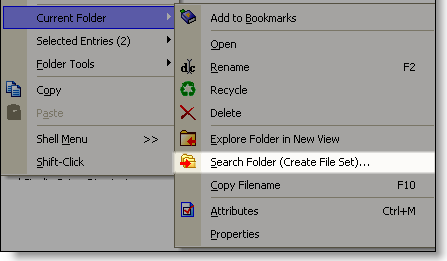 When browsing for a folder such as selecting a Target folder when copying files, FileBoss will now attempt to open the browse dialog at the folder that is currently in the associated field. The default button size for toolbars has been changed to Large. Previously the button size for new installations was determined by the screen size. 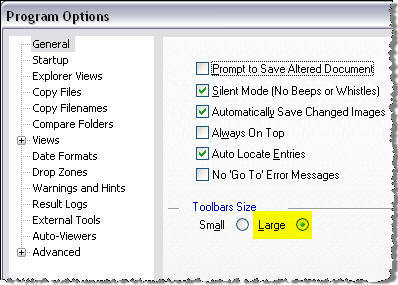 To change to the large buttons use the Tools > Options... command from the main menu and under Toolbar Size select Large. By default Bookmarks for drives now display volume names along with drive letters instead of just drive letters. Previously some tabs would be blank such as when the My Computer folder was displayed. Fixed problem where really long filenames could corrupt the display of the tabs for each view, i.e. Explore and File Set windows. A number of annoying warnings have been eliminated that didn't protect the user from anything very harmful. New buttons are in the works for FileBoss and the new ones are here that give an idea of what is coming. Added generic help for all bookmarks. Previously a Help error as displayed when Help should have been shown. Fixed problem where the splash screen would sometimes display with random pixels corrupted. On new installations the toolbars are now arranged slightly differently. The situational toolbars for the Explore and File Set views are now on top rather than the left side of FileBoss. This only affects new installations of FileBoss. For new installations the Tips of the Day feature is now turned off by default. Use the Command Bar (F8) to equate file times. After files have been selected use these Command bar commands for setting file times. Note that unlike the Change Attributes and Touch routines only one of the file times can be set at a time. To set multiple times chain the commands. When checked you will not be asked to confirm any name changes. For safety reasons this checkbox will be cleared every time FileBoss is started but once checked it will stay checked for the current session. This is an extremely advanced action and should not be used by anyone who doesn't really know what they are doing. Normally this routine is only need in extreme cases of a corrupted file system. Use the Actions > Advanced > Change Advanced (NTFS) Attributes command from the main menu after selecting the files you want to change. The File Copy tools now allow optional patterns that specify which files should and / or should not be copied when recursing through subfolders. Files, folders or tree structures can now be duplicated by the thousands just as easily as one at a time. The progress meters while copying files now show the progress of individual files. To better access folders containing thousands of files and subfolders FileBoss now has a special option that allows access to these folders in seconds rather than minutes. Command Bar commands can be chained together so that they are executed one after the other. To chain commands type " <> " between them. Files can now be found by NTFS attributes (Temporary, Offline, etc) as well as by the normal file attributes. In addition any NTFS attributes are displayed in the same column as normal file attributes. You can now click to select a file and immediately start a drag and drop operation in both Sticky Select and Normal Select mode. Previously this was only available in Normal Select mode. FileBoss now detects when new hardware is plugged in and will adjust the list of available drives accordingly. The item 'Shell Menu >>' that was at the bottom of the many right-click menu is now at the top of the menus and named Windows Explorer Menu >> to make it easier to understand and find. When files and folders are dragged across folders during a Drag & Drop operation the folder underneath the cursor is highlighted for better clarity and conformity with other applications. Many enhancements and small fixes for selecting entries with the mouse. Now more compatible with Windows Explorer. When deleting an empty folder from the left-hand window of an Explorer View FileBoss would sometimes (but infrequently) freeze. A new folder would sometimes be created under the wrong parent folder. After a specific sequence of moving between folders in the Navigation window involving the mouse and keyboard, a new folder would sometimes be created under the wrong parent. Fixed bug where FileBoss would crash if the format for displaying dates was changed in the Date Formats panel of the Tools > Options... dialog. The cut and paste work around is not longer needed. Sometimes when selecting a network based target for a copy operation the shared network folders would not be displayed as choices. Instead the only thing displayed would be the drive letter followed by a dollar sign, e.g. C$. The File Copy routines including, Copy File, Move File, Update and Quick Merge now allow patterns that specify files should and / or should not be copied when recursing through subfolders. In the above example all files would be copied except those with bak and tmp extensions and those with names starting with a tilde (~). Separate multiple patterns with the bar character (|) and precede patterns to be excluded with a minus sign (-). If no patterns are entered all is assumed (i.e. leaving the field blank is the same as entering a * or the traditional *.*). Note that these patterns only affect file in subfolders. Files directly selected will be copied no matter what patterns are entered. See Copying Files for more. Starting with version 1.5 of FileBoss commands can be chained together so that they are executed one after the other. To chain commands type " <> " between them. Tells FileBoss to display the folder <md>\FileBoss Data in the current Explore View (or create a new Explore view if necessary). (Note that <md> is a meta-folder representing the current user's My Documents folder. Tells FileBoss to set a filter so only files matching the following pattern are displayed. There is no limit to the number of commands that can be chained other than the line can not exceed 32,000 characters. See The Command Bar for more about the Command Bar and Chaining commands. The default sort direction (e.g. latest to earliest or earliest to latest) for file times and file sizes. To change these defaults select Tools > Options... from the main menu and then select the Views panel from the list on the left-hand side. Check or clear the boxes as appropriate (as shown in the area highlighted in yellow below). The item Shell Menu >> that was at the bottom of the many right-click menu is now at the top of the menus and named Windows Explorer Menu >> to make it easier to understand and find. And the Shift-Click item that was duplicated at the top of the menus is now only listed at the bottom. The support includes using the attributes to search for files and folders in the Find By Attributes routine and displays them in the Attributes column of any folder listing. The progress meter displayed when copying files now shows the progress of individual files (if they are large enough to take more than several seconds). Note that for small files the lower progress meter will not move as the time it takes Windows to update your display could significantly slow down the copy process. A number of small enhancements have been made to the way entries are selected when dragging the mouse. Most of these focus on making the process more natural by using the same techniques that are used in familiar programs such as Windows Explorer. One example is FileBoss now distinguishes between clicks on the actual name of an entry and clicks to the right of an entry (but still in the name column). You can now click on an entry to select it and, while holding the mouse button down, drag the entry to drop it somewhere else. Previously this common operation was not available when in Sticky mode. As the mouse passes over folders while in a Drag operation the any folder underneath the mouse cursor is now highlighted. 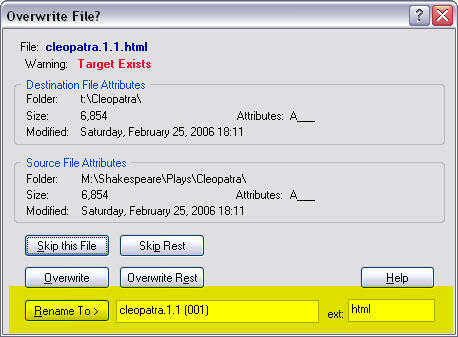 The graphic below shows the twelfth_night.1.1.html file having been clicked and being dragged over the Twelfth Night folder. FileBoss can now make one or thousands of copies of selected files and folders in just one operation. Select the file(s) or folder(s) you want to copy and then use the Actions > Duplicate... command from the main menu. 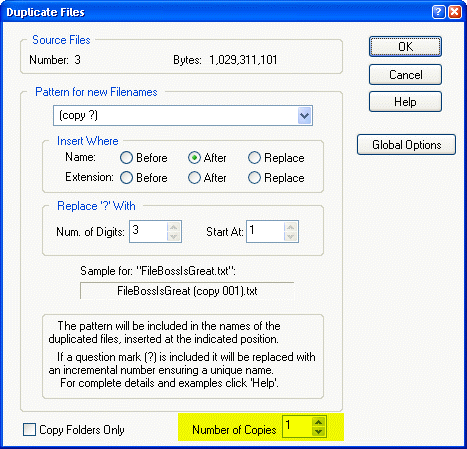 In the Duplicate Files dialog specify the normal options and then enter the number of copies you want to created by entering the appropriate number in the field at the bottom-right of the dialog. There is a new routine to quickly merge files from one folder / path to another without having to use the set all the options in the basic Copy To dialog. To use this new too select the files and or folders you want to merge in either Explore View or in a File Set and then select Actions > Merge... from the main menu, press Ctrl+Shift+F7 or use its command button. You can now limit which files are copied by whether Windows has set the Archive flag (e.g. the file has been changed since it was last backed up.) The new option is on the Copy Files dialog as shown below. Bookmarks are now sorted alphabetically by default. If you like the old way (sorted by when they were created) you can change that in the Tools > Options... dialog as shown below. Meta folders and Bookmarks can now be used most anywhere a full path to a folder is used, creating File Sets, comparing folders, copy to dialog, command bar and many other places. The syntax is to enclose the meta folder or bookmark name within angle brackets such as, <meta folder> or <bookmark>. Since a meta folders and bookmarks define complete paths they can not be tacked onto the end of other paths. However other folders can be added on to them. For example to specify FileBoss's default data folder you could use <md>\File Boss Data where <md> specifies the My Documents folder. 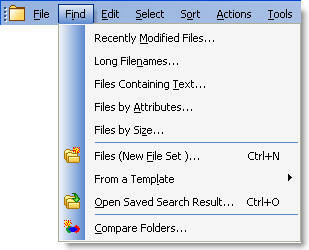 To see a list of available meta folders on your computer use the Tools > Special Folders command from the main menu to display the list of Special Folders in a dialog. The meta folder names are on the left. Abbreviations for the meta folders, such as md for My Documents usually consist of the first letter of the first two words in the meta folder name. Microsoft Outlook attachments has been added to the list of objects that can be dropped on a folder in FileBoss. The same can be done with Microsoft Outlook (full or Express) message, Microsoft Outlook Express Newsgroup posts as well as many other objects from other programs and email clients. Corrected bad design where auto-viewers ( from the main menu) were not listed unless they were active. Now they are listed even if they are inactive so that they can be easily activated. New options have been added to the setup panels for both External Viewers and Tools. The definitions can now be saved to disk and loaded into another FileBoss. In addition new qualifiers have been added such as whether or not the tool / view will apply to Files or Folders. The default location for user created files (such as when File Sets are saved to disk or a new options file or window list is created) has been separated from the default location for FileBoss's automatically generated data files. Both places can be set in the Tools > Options... dialog as shown below. Fixed crash when filenames contained a percent sign followed by one of several specific letters, with or without intervening digits, FileBoss would sometimes crash. Fixed crash where computers system that had really long filenames anything over 255 characters would cause FileBoss to crash but only rarely and not necessarily. Fixed problem where file sizes greater than four gigabytes would not display correctly in the contents view. Fixed extremely rare problem where FileBoss would recurse seven levels down when a drive was mounted that referred to itself. Fixed rare situation where if FileBoss was closed while another program was processing a lengthy drop that originated from FileBoss it would crash just before closing. Version 1.31 of FileBoss can be installed directly over your current FileBoss. FileBoss now displays specific folders (such as when restarting or from a bookmark) much faster depending on the folders being accessed. When the network paths (such as \\Company\Server\C) were entered in the command bar FileBoss would not always display the indicated drive or folder. When selecting files with the Select Files Dialog if the By Size option was enabled and the minimum and maximum file sizes were equal (most notable when both were set to '0') FileBoss would not select any files. The exclusion indicator (-) would not be honored, e.g. Select *. * |-*.exe would still select all exe files. FileBoss has been re-skinned to sport a modern look and feel. Just press F8 and the Command bar will appear so you can start typing. Type Help in the command bar to learn more about it and later just type a command followed by Help or a question mark and a bubble will appear to how to use the command. which will immediately create a new folder named Wedding Pictures in the current folder. Opens a DOS window set to the Explore View folder. Click here for the complete details and command list. There is a new Sequential Renaming panel that simplifies renaming files with sequential numbers. The previous panel is still present as it gives ultimate control over renaming files and, as such, has the new tile of Advanced. Both routines now allow you to specify an increment to use when using or adding sequential numbers to filenames. The panel for applying transformations when renaming files has been changed slightly to lessen the chance of applying unwanted transformations by mistake. The toolbars can now be customized by adding and deleting buttons. To customize any toolbar right-click over the toolbar and select Add / Remove buttons from the context menu. You can also remove button quickly by simply holding down the Shift key while dragging a button off the toolbar and into the center of FileBoss's window. Simply hold down the Ctrl key while clicking on one of the items in any menu of bookmarks or file filters. You will not be asked for confirmation the item will simply be deleted. FileBoss can now be told to always start when Windows does or to start with Windows if FileBoss was running when Windows last closed. In Explore View pressing these button is the same as clicking the forward or back toolbar buttons. Previously the same text was displayed on FileBoss's title bar and the tab for the active view, e.g. C:\....\Pets and C:\My Pictures\Pets, now what will be displayed on the tile bar and on the tabs can be set separately. Use the Tools > Options... command from the main menu and select the Explorer View group. The settings are under the Display Settings group. 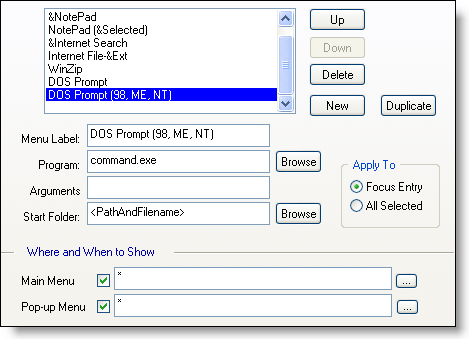 Dropping to DOS for a specified folder can be accomplished using external tools. This isn't a new feature but is not documented and, for new installations, two default tools will be installed, albeit disabled, for these tools. Which tools you use depends on whether your version of Windows is 98, ME and NT or Windows 2000 and later. You can enable the appropriate tool using the Tools > Options command from the main menu and selecting the External Tools group. For those who are not installing a fresh version of FileBoss the following can be used examples as to how to create the appropriate tool. The first is for Windows 2000 and later versions. The second is form Windows 98, ME and NT systems. Added Close All Other Windows item to the right-click menu over the tabs for the views. The bookmarks display now includes a dynamic list of available drives that reflect the current state of your file system every time the bookmarks are displayed. If you would like to remove the old, static drive bookmarks simply click on each one you want to remove while holding down the Ctrl key. The dynamic drives can be displayed with or without their names, e.g. 'Local Disk (C:)' or C:\. You can change where and how the dynamic drive entries are displayed using the Explore panel on the Tools > Options... dialog. When a folder is the current item the menu command Current Folder > Search Folder... will invoke the Create File Set dialog with the path to search set to the current folder. 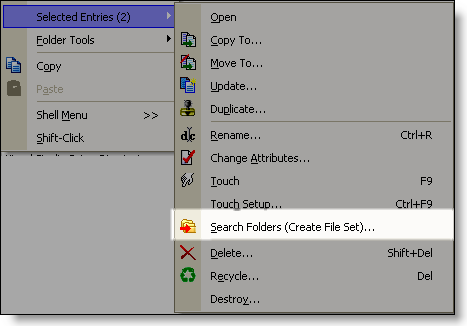 When multiple folders are selected the menu command Selected Folders > Search Folders... will invoke the Create File Set dialog with the path to search set to each of the selected folders so that multiple folders can be quickly searched at the same time. The Edit Copy Names to Clipboard > commands (F10 and Ctrl+F10) will copy the selected folder's path and name (or just name) to the clipboard if the Navigation pane has the focus. If the Contents window has the focus the paths and names of its selected items will be copied. Click and Drag is available in the Contents View when Sticky mode is turned off, i.e. when the method of selecting files emulates the way it is done in Windows Explorer. Sticky mode can be turned off using Select > Sticky Selections toggle from the main menu. When this is the case you can still click and drag to select multiple files at once by clicking and dragging to the right of the filename column. When FileBoss starts it checks the list of active Drop Zones to make sure that they still exist. Previously if a folder associated with a Drop Zone did not exist FileBoss would force you to select a new folder or delete the Drop Zone. Now Drop Zones can be kept so that they can be used when the target folder becomes available again. This is hand for network connections and temporary storage devices that are not always available. This might also have happened when dragging files from another program. An apparently random stability problem (program would crash or hang) has been fixed. This could happen in any windows configuration but it was most visible on systems with certain plug-ins installed that were heavily used. Changed the minimum width and height FileBoss can be to resized down to. Now the default minimum still allows a few folders and entries to be seen depending on the arrangement of Results window and other toolbars. FileBoss can be resized down to the small title bar as before by checking the Allow FileBoss to be resized to a small title bar box in the Advanced 2 panel after selecting Tools > Options... from the main menu. On some systems using non-standard font sizes the title text on the View tabs would sometimes be too large for the tab itself. Progress dialog now shows matching 'Checked' and 'Processed' numbers. Previously the way existing folders where recorded the Copy Progress dialog could give the impression that not all files where copied when the actually had been. If the options for the new filename was set to 'After Extension' or 'Before extension' and a file did not have an extension, the addition would be put after the name. This has been changed so that when either option is set and no previous extension exists the added text becomes an extension. If this is not he behavior you want use the 'After Name' option instead. Changes to the Allow only one FileBoss to run at a time option on the Startup panel of the Options dialog would not take effect until FileBoss was closed and restarted. Changes now take effect as soon as the Options dialog is closed. Fixed Drag & Drop feedback error where FileBoss would sometimes say that a file could not be dropped when in reality it could be. Version 1.220 adds significant improvements to FileBoss's Drag & Drop interface for those working with folders holding thousands and tens of thousands of files. In addition there are a number of small improvements and bug fixes. Drag and Drop operations become unusable when dragging large numbers of files (like tens of thousands) from any application to any application. Previously FileBoss was no exception. Now you can Drag thousands of files from one FileBoss window to another with the same response time as when you only drag one file. The special article about Drag and Drop explains this both in summary and in detail. See All about Drag & Drop for complete details. If FileBoss has been set to always open in the same instance - e.g. if a folder is clicked on the desktop and FileBoss is already open that folder will open as a new view in the current FileBoss - you can now force a new instance by holding down the Ctrl key while FileBoss starts. Previously some Progress dialogs updated too frequently making reading difficult and slightly slowing down some of the operations they were reporting on. Previously Explore Views would update every time the size of a file changed. This could be quite disconcerting, and would sometimes slow the system down, when files where being repeatedly written to by other applications. Folders could not be renamed in the Navigation Window. When a result log was not active the command would not display the most recently used result log even when it was available. Instead it would just as for the result log name. 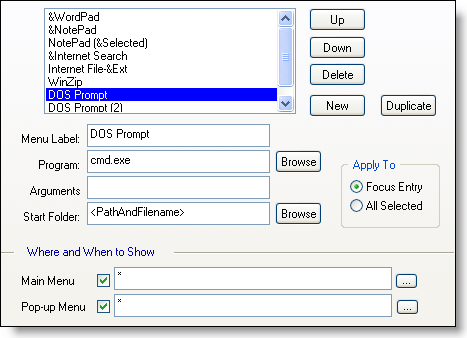 The name of a Drop Zone would not change immediately after it had been set using the Properties command from the Drop Zone's right-click menu. Pressing the space bar to select / deselect an entry would clear the F3 key's memory of what to do next. Selected information on status bar would not update after pressing the Space bar (to select / deselect the current entry) or when the Up and Down Arrow keys were used with the Ctrl key held down. Inline filename editing in the Contents Window would not scroll long names in the edit box. The graphics for the delete, recycle and destroy confirmation dialogs would tile when displayed under Windows 2000. Updated File Set Properties would not be displayed correctly after removing entries from a File Set. Version 1.200 put FileBoss through its final stress tests before going into general release. Thanks to all who used it on such diverse sets of hardware and software. Version 1.210 fixes a few significant problems, a number small annoyances and adds some much needed conventions to the user interface. The two most significant bugs were crashes 1) when running under Windows 2000 and 2) when the host system had shell plug-ins installed that use an eSellerate wrapper. All of this and more is detailed below. While this was not a certainty it was quite regular. The new folder would be created and displayed and then FileBoss would freeze. 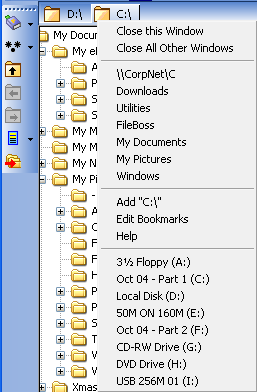 Pressing the '*' key to expand all folders below the current folder in a Explore View navigation window would often hang FileBoss, especially if there were a large number of subfolders. The '*' has been disabled. The plus (+) and minus (-) keys work as expected and the asterisk key (*) will still expand all folders in a File Set view. You really had to work to get this one to happen. Now all that work would be in vain. But the shortcut could be opened by right-clicking and selecting 'open' from the menu. Clicking the bookmark button on the Explorer toolbar did nothing even though the hint indicated that it would add a bookmark to the list. Both the hint and the action were wrong. Now clicking the button will display the list of bookmarks as menu items along with items for editing and adding bookmarks. Changing the fields to be displayed using the View > File Tip Balloons > menu would not always change the settings. The tips now work as expected and when set for one window are set for all windows. When the Windows integration option (Tools > Options... Windows Integration) Open in an existing FileBoss window if present option was checked it would not take effect unless Windows integration was turned off and then back on. Now it takes effect immediately when checked (or unchecked). The correct number of entries to be merged is now displayed. The copy warnings (Ask, Rename, No, etc) were taken from the settings for the main copy routine (Actions > Copy To...) rather than settings from 'Advanced 2' panel of the Tools > Options... dialog. This has been corrected. The wrong progress meter would sometimes be displayed when copying files using the Action > Copy To... command from the main menu. This only happened when a mixture of files and folders were being copied. Changing formats for the various dates (e.g. Modified, Created, Accessed) in the Date Formats panel of Tools > Options... dialog had no effect and would even revert to the defaults when the dialog was closed. If FileBoss was minimized when it was closed, either expressly or due to Windows shutting down, when it would be minimized when restarted. In the interests of standardization FileBoss will no be displayed in a normal sized window if it was minimized when last closed. Sometimes when FileBoss was restored from being minimized the location of the toolbars and the width of the Navigation window would be aggravatingly different than what they were before being minimized. This has been corrected. Tips for menu items and toolbar buttons are now displayed on the status bar. Most noticeable on slower computers and/or under older operating systems. Moved the default location of view specific toolbars to the left side of FileBoss's main window. When first installed or when the options revert to their default state the View specific toolbars, i.e. for Explore and File Set Views, are now displayed down the left edge of the application window. This puts them right next to the Navigation window where they should logically be. On new installations the Action and Select toolbars (formerly located at the bottom and right side of the workspace respectively) are now hidden by default. Previously the notice text could be changed by the user for no reason other than to confuse. Help guide entry "Finding Files Containing Text" was broken. Fixed. This same help was missing from other menus as well.